6 With what events did the war begin? 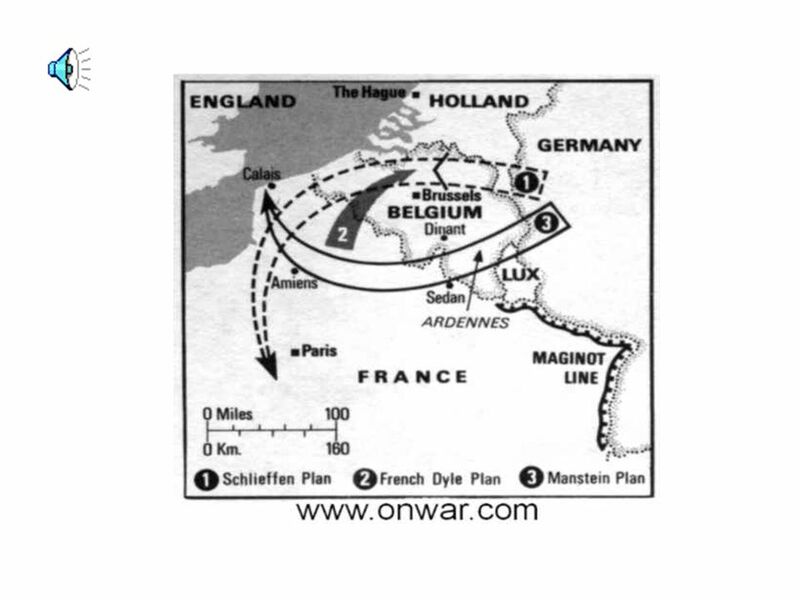 7 Europe Goes to War Chapter 24, Section 2 How did the German invasion of Poland lead to war with Britain and France? 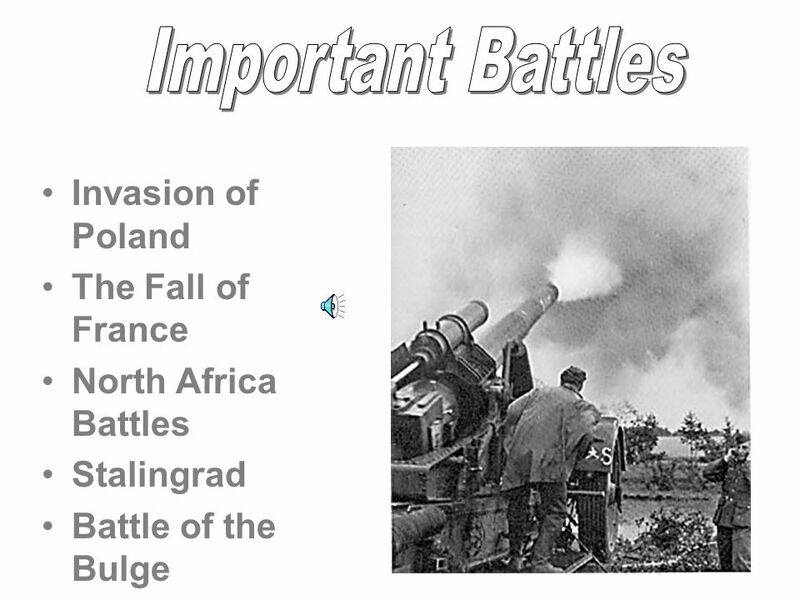 What wartime victories and setbacks did Germany experience in western Europe? Why was the Battle of Britain an important victory for Britain? 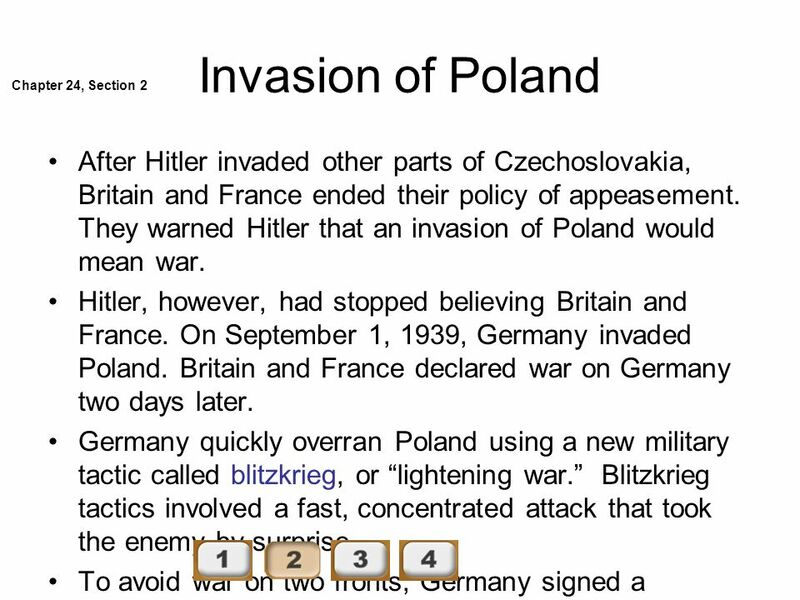 8 Invasion of Poland Chapter 24, Section 2 After Hitler invaded other parts of Czechoslovakia, Britain and France ended their policy of appeasement. 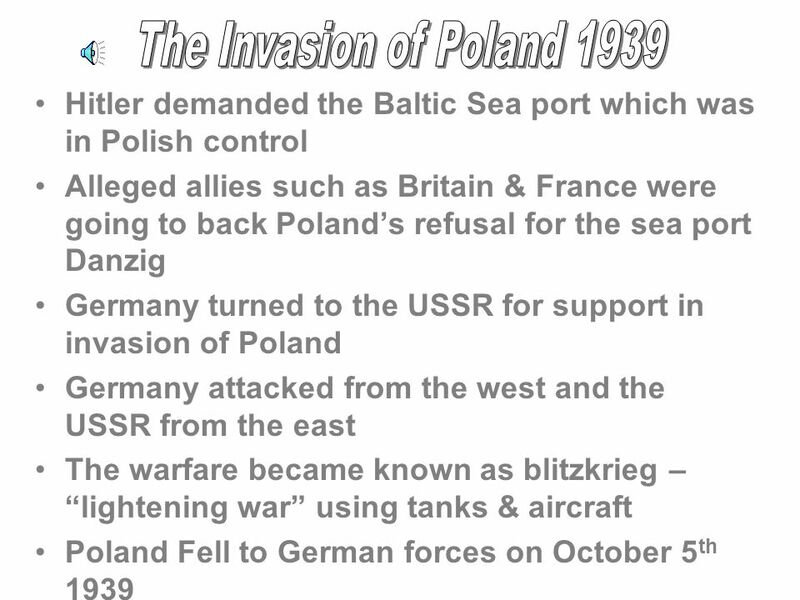 They warned Hitler that an invasion of Poland would mean war. 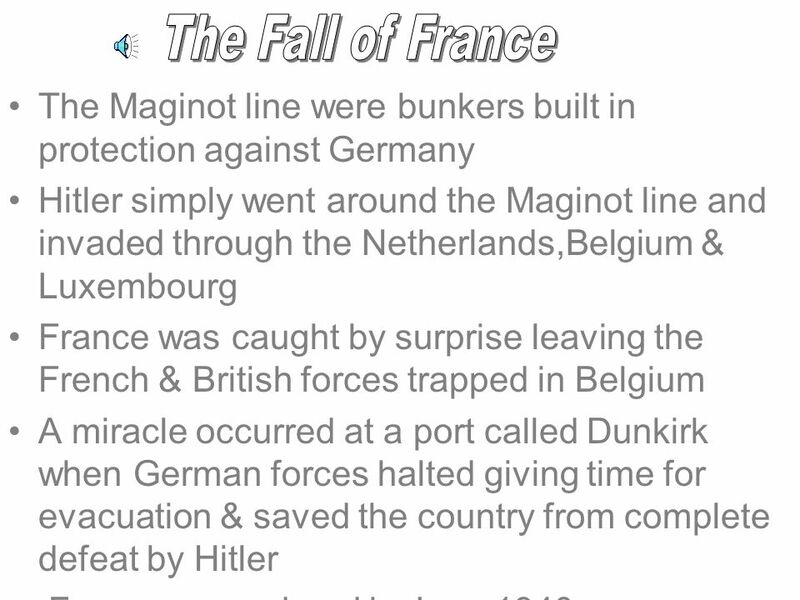 Hitler, however, had stopped believing Britain and France. 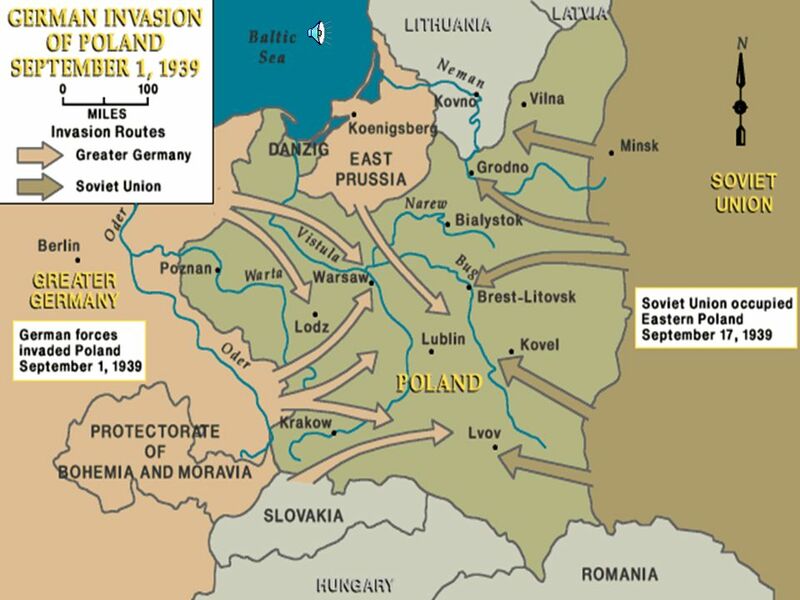 On September 1, 1939, Germany invaded Poland. Britain and France declared war on Germany two days later. 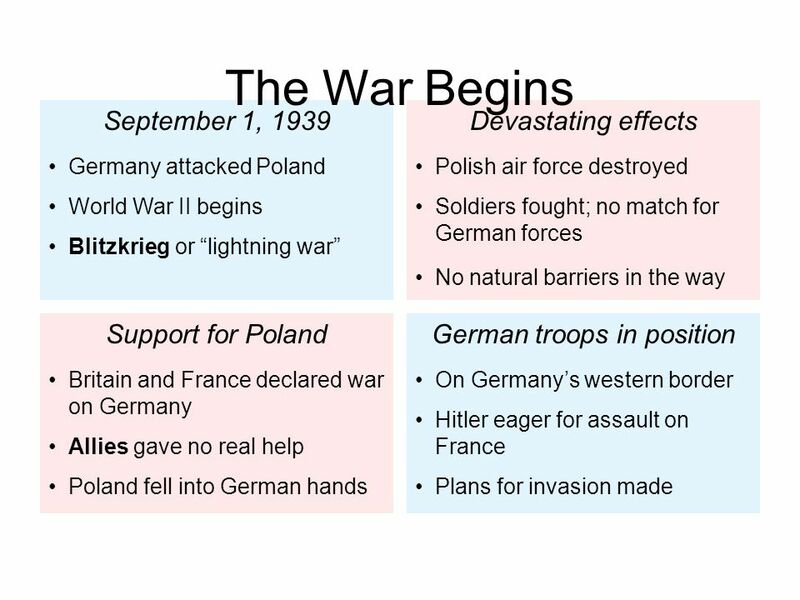 Germany quickly overran Poland using a new military tactic called blitzkrieg, or “lightening war.” Blitzkrieg tactics involved a fast, concentrated attack that took the enemy by surprise. To avoid war on two fronts, Germany signed a nonaggression pact with the Soviet Union. In a secret addition to this pact, the two nations agreed to divide between them the independent states of Eastern Europe. 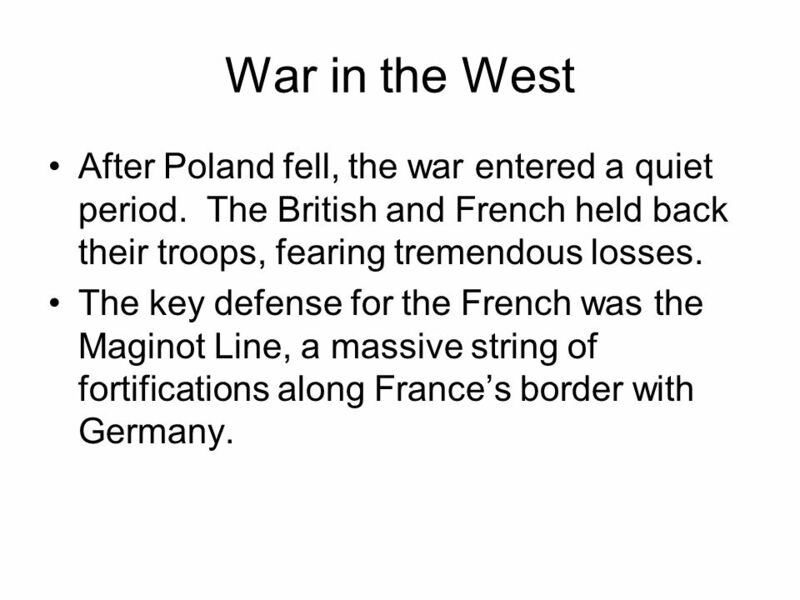 Chapter 24, Section 2 Early Stages of War in the West “Phony War” and the Maginot Line: After Poland fell, the war entered a quiet period. The American press called this lack of combat a “phony war.” France prepared a massive string of fortifications, known as the Maginot Line, along its border with Germany. Germany Attacks: In April and May 1940, Germany attacked and quickly conquered Denmark, Norway, the Netherlands, Belgium, and Luxembourg. 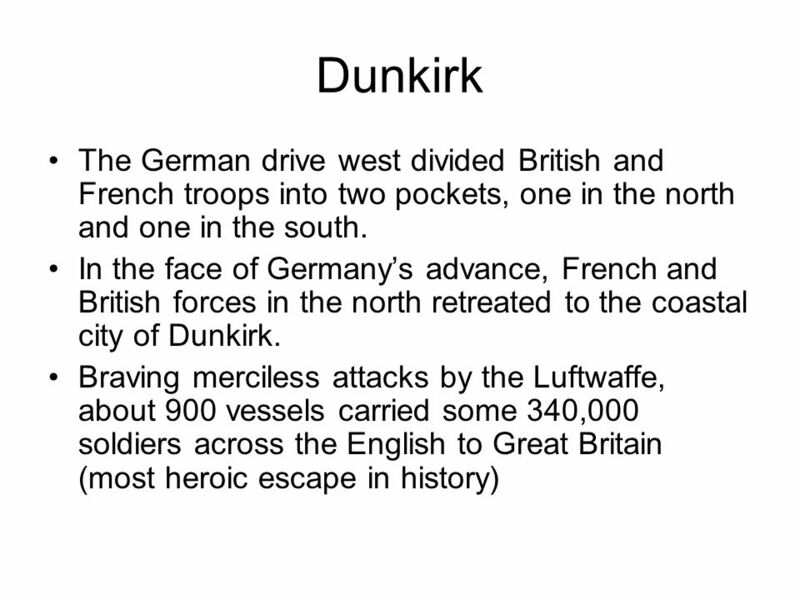 Dunkirk: When Germany advanced on France, British and French forces retreated to the French coastal city of Dunkirk. From there, hundreds of thousands of soldiers were ferried to Great Britain in one of the greatest rescues in the history of warfare. 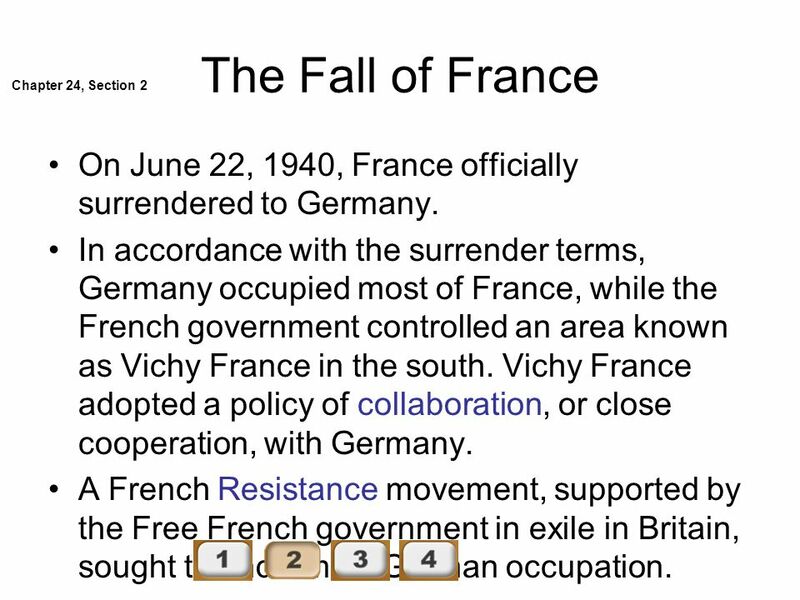 10 The Fall of France Chapter 24, Section 2 On June 22, 1940, France officially surrendered to Germany. In accordance with the surrender terms, Germany occupied most of France, while the French government controlled an area known as Vichy France in the south. Vichy France adopted a policy of collaboration, or close cooperation, with Germany. A French Resistance movement, supported by the Free French government in exile in Britain, sought to undermine German occupation. 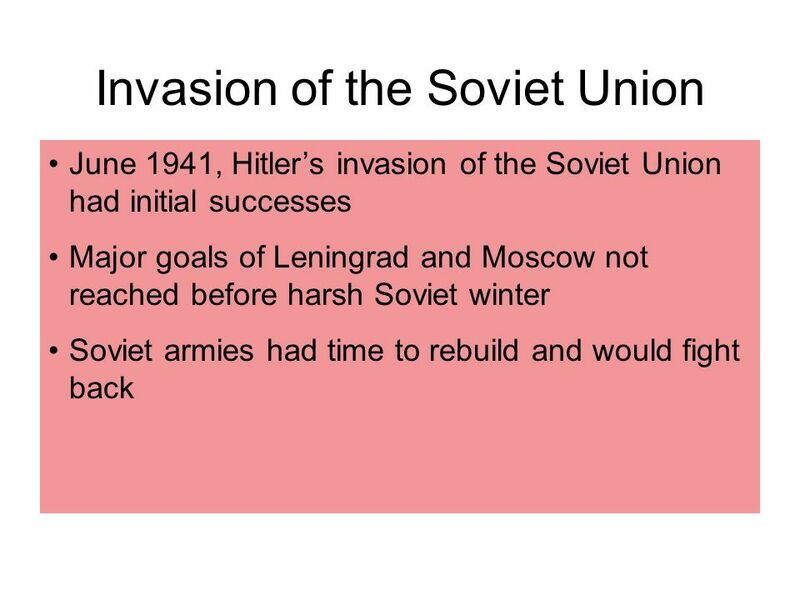 By the summer of 1940, Hitler had conquered most of Western Europe and seemed on the verge of conquering the Allies, the group of countries that opposed the Axis Powers. 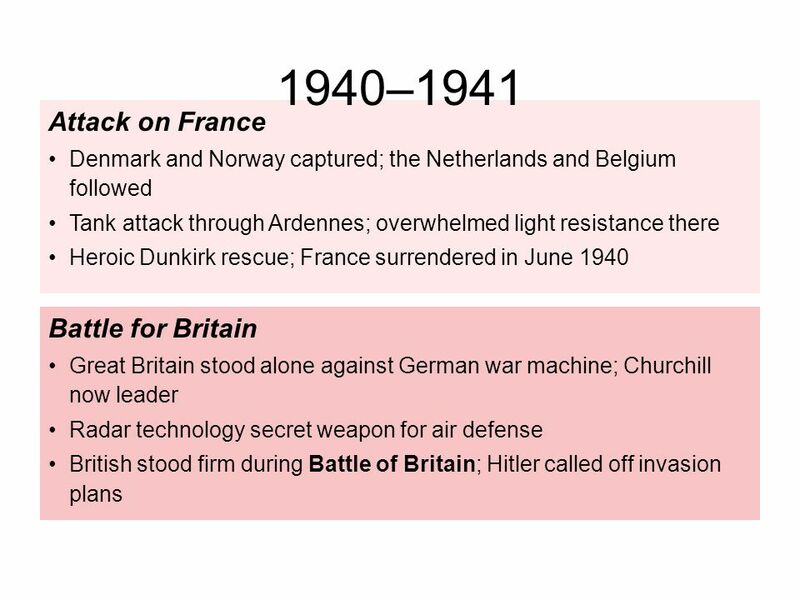 Britain alone stood against the Axis. 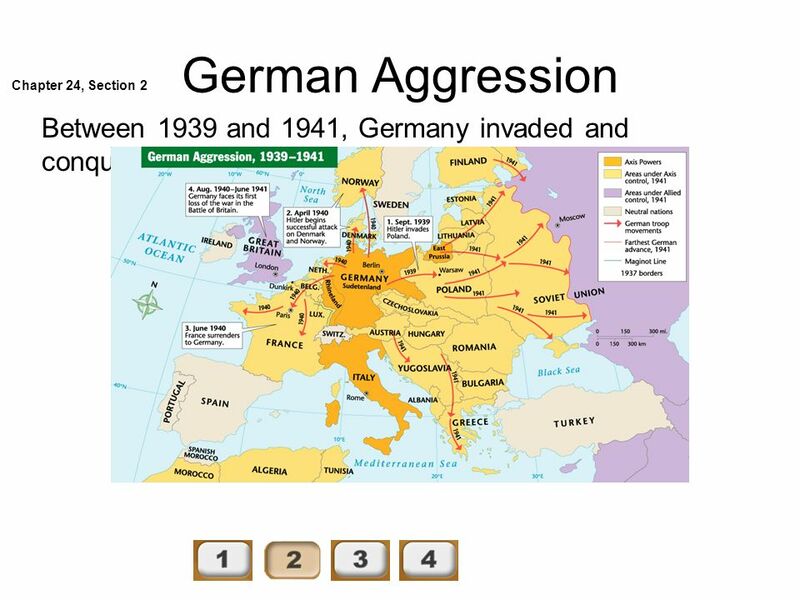 11 German Aggression Chapter 24, Section 2 Between 1939 and 1941, Germany invaded and conquered much of Europe. 12 German Aggression Chapter 24, Section 2 Between 1939 and 1941, Germany invaded and conquered much of Europe. Chapter 24, Section 2 Relentless Attack Before attempting to invade Great Britain, Germany wanted to establish superiority in the air. In August 1940, Germany launched an air assault on Britain, called the Battle of Britain, which continued well into September. At first, Germany only attacked British military sites. However, it later began bombing London and other cities to decrease British morale. 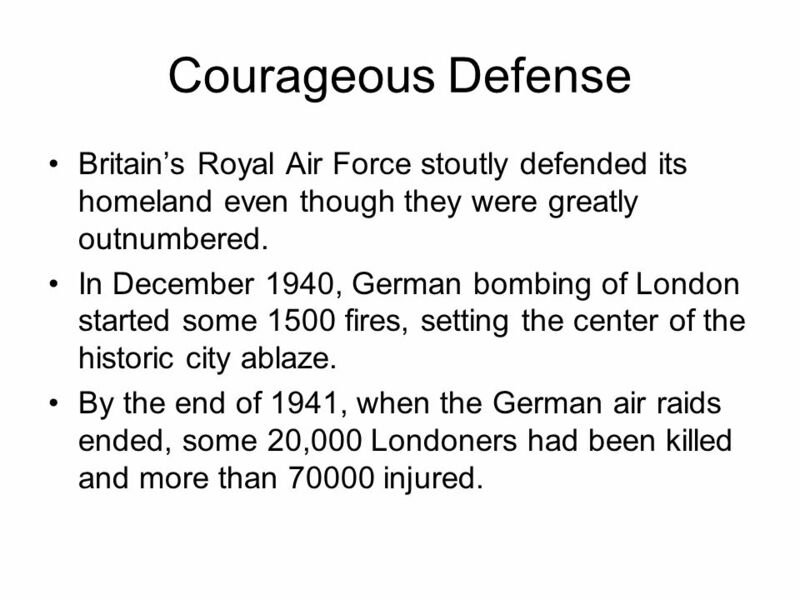 Courageous Defense Although greatly outnumbered, Britain’s Royal Air Force (RAF) worked to shoot down German bombers. 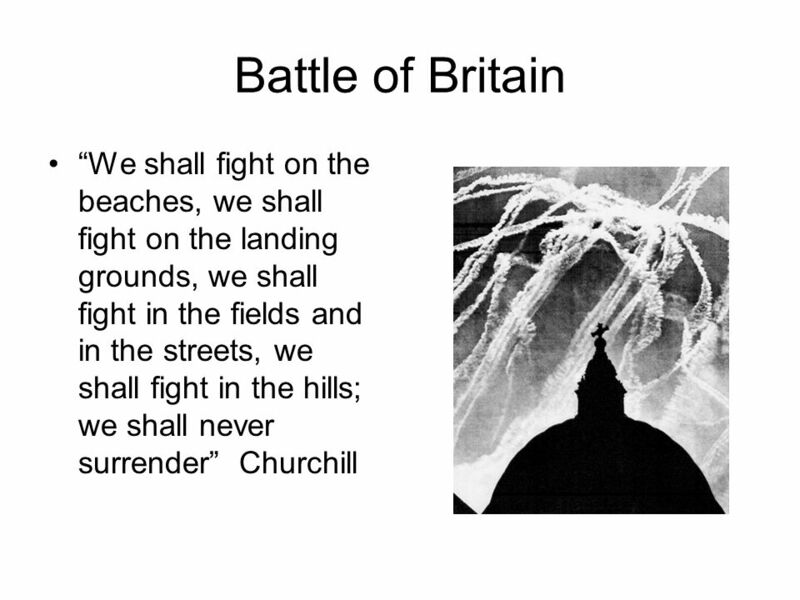 Despite massive losses, the British people kept their will to fight. By February 1940, British scientists cracked the German secret communication code. 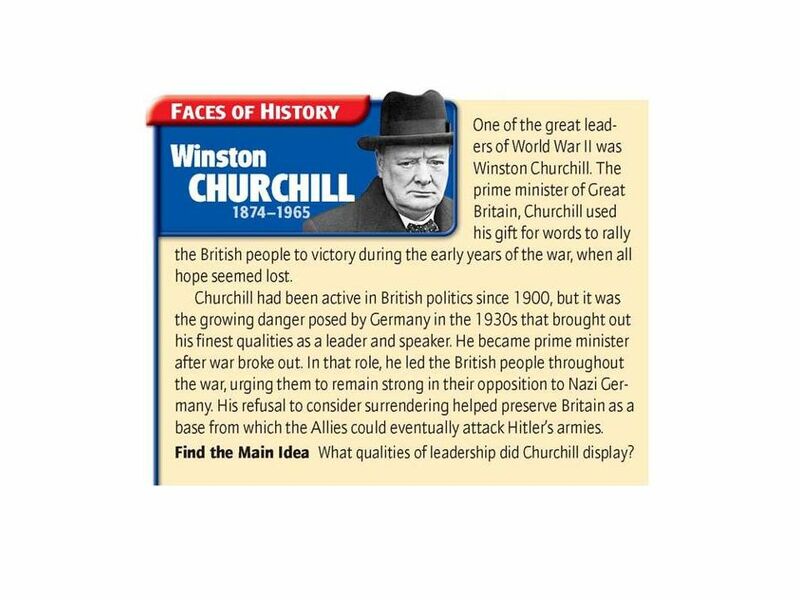 This enabled Britain to get a general idea of Hitler’s battle plans. 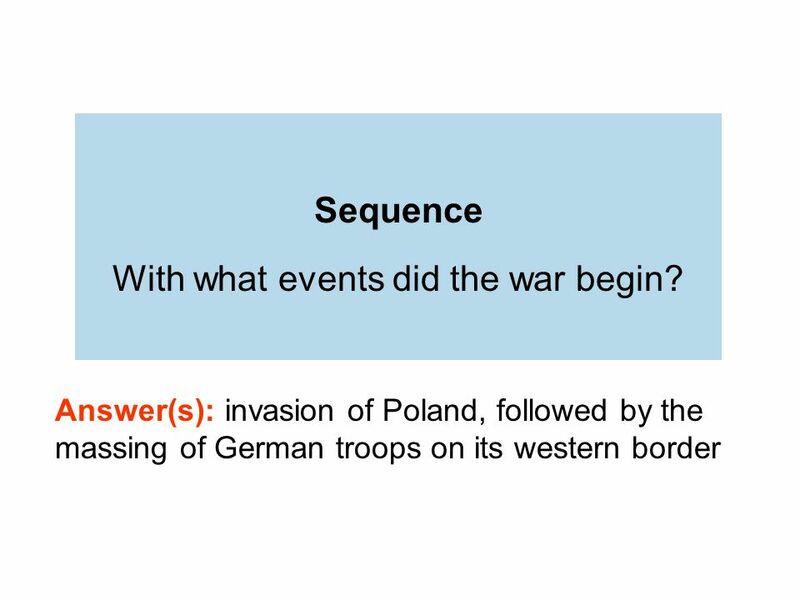 Chapter 24, Section 2 How did Britain and France react to Hitler’s invasion of Poland? (A) They declared war on Germany. (B) They continued their policy of appeasement. (C) They signed a nonagression pact with the Soviet Union. 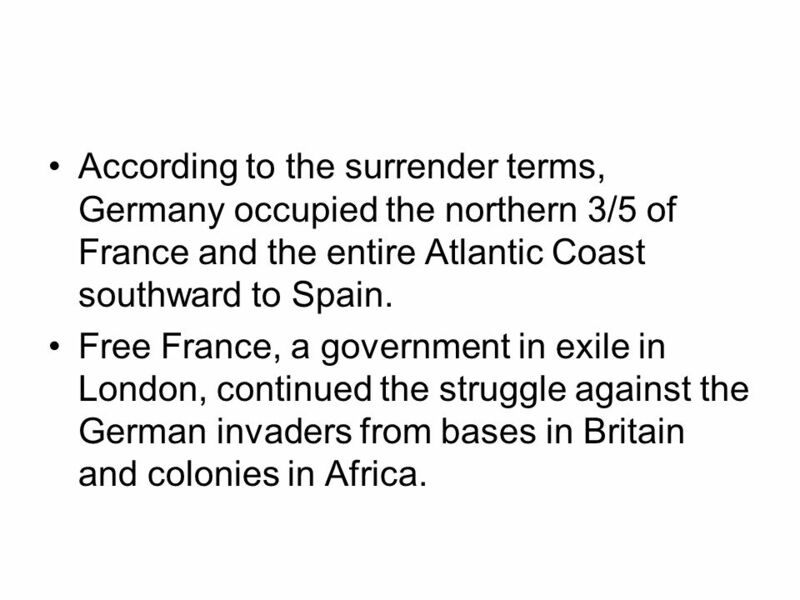 (D) They surrendered to Germany. Why was the Battle of Britain considered a victory for Great Britain? (A) It gave Britain control of Denmark and Norway. (B) It resulted in very little damage to London. (C) It failed to decrease British morale. (D) It helped the French Resistance reconquer France. Want to link to the Pathways Internet activity for this chapter? Click here! 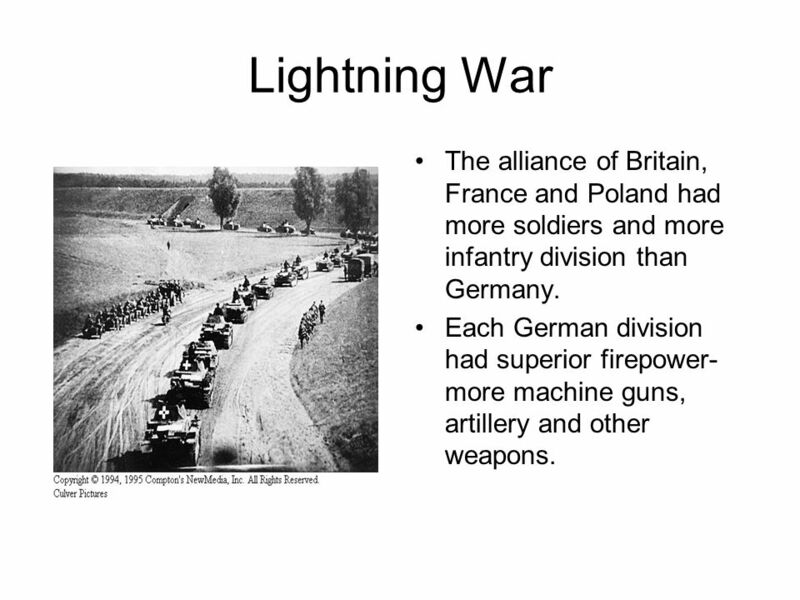 25 Lightning War The alliance of Britain, France and Poland had more soldiers and more infantry division than Germany. Each German division had superior firepower- more machine guns, artillery and other weapons. 26 German practiced a new form of attack that they unveiled in the invasion of Poland. Called blitzkrieg, this new military tactic included a fast, concentrated air and land attack that took the enemy’s army by surprise. 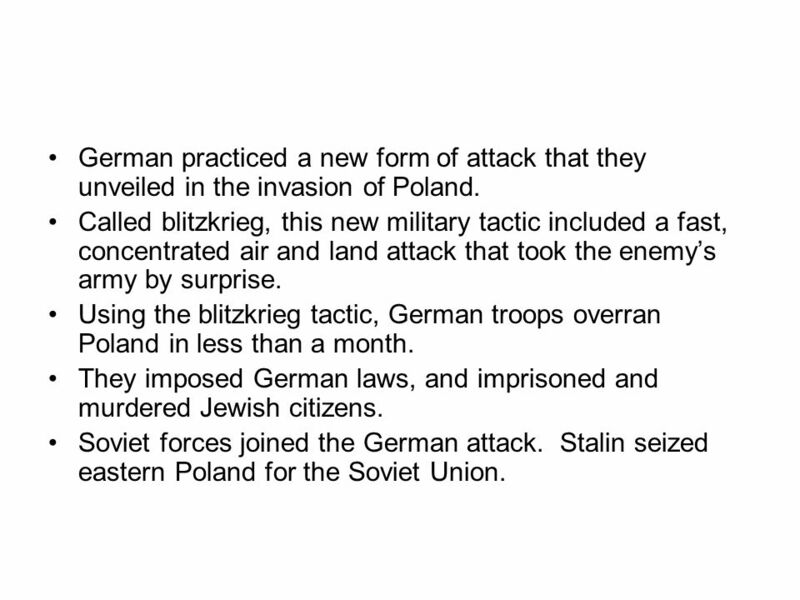 Using the blitzkrieg tactic, German troops overran Poland in less than a month. They imposed German laws, and imprisoned and murdered Jewish citizens. Soviet forces joined the German attack. Stalin seized eastern Poland for the Soviet Union. 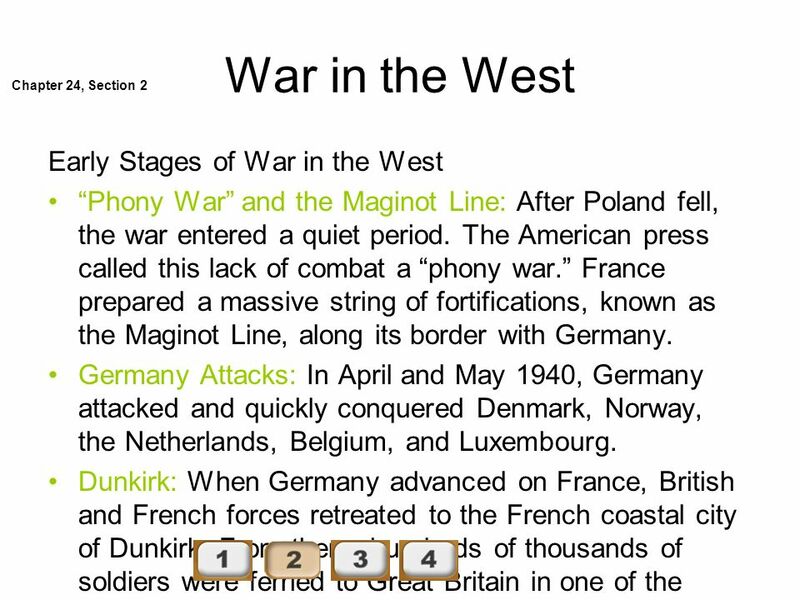 27 War in the West After Poland fell, the war entered a quiet period. The British and French held back their troops, fearing tremendous losses. 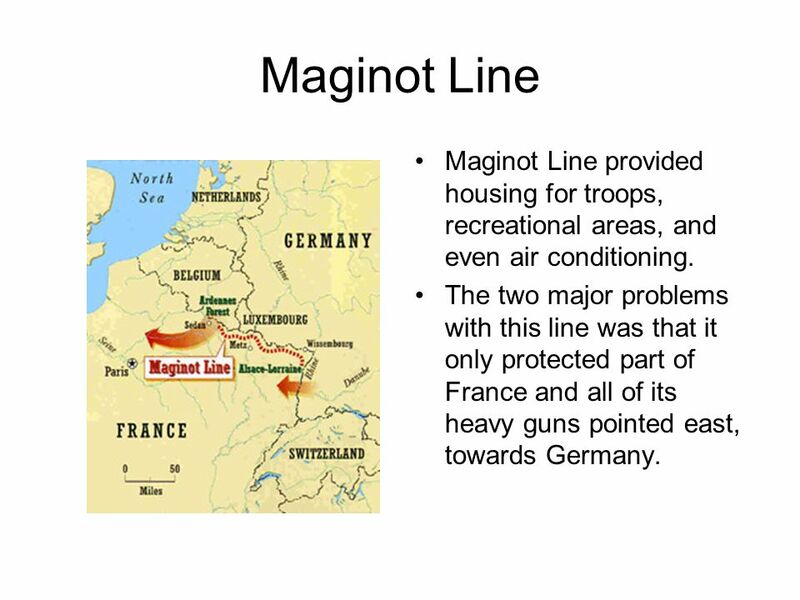 The key defense for the French was the Maginot Line, a massive string of fortifications along France’s border with Germany. 28 Maginot Line Maginot Line provided housing for troops, recreational areas, and even air conditioning. The two major problems with this line was that it only protected part of France and all of its heavy guns pointed east, towards Germany. 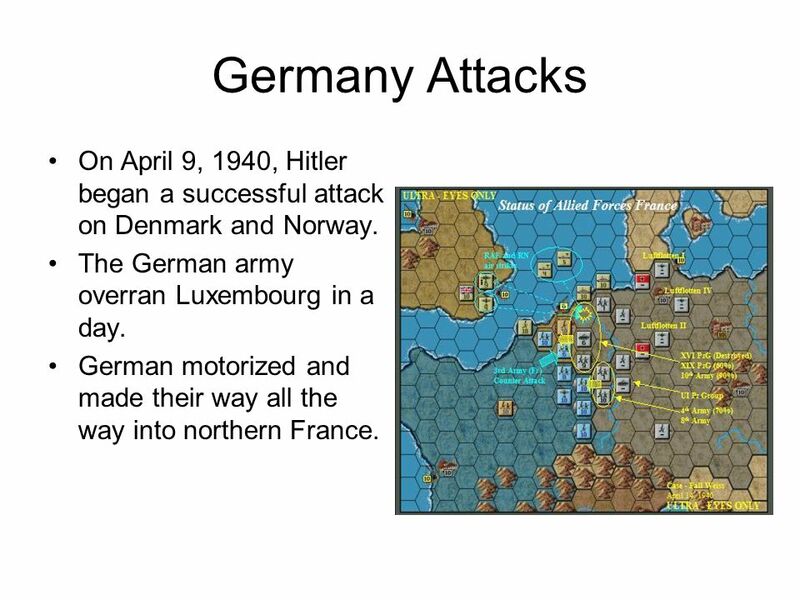 29 Germany Attacks On April 9, 1940, Hitler began a successful attack on Denmark and Norway. The German army overran Luxembourg in a day. German motorized and made their way all the way into northern France. 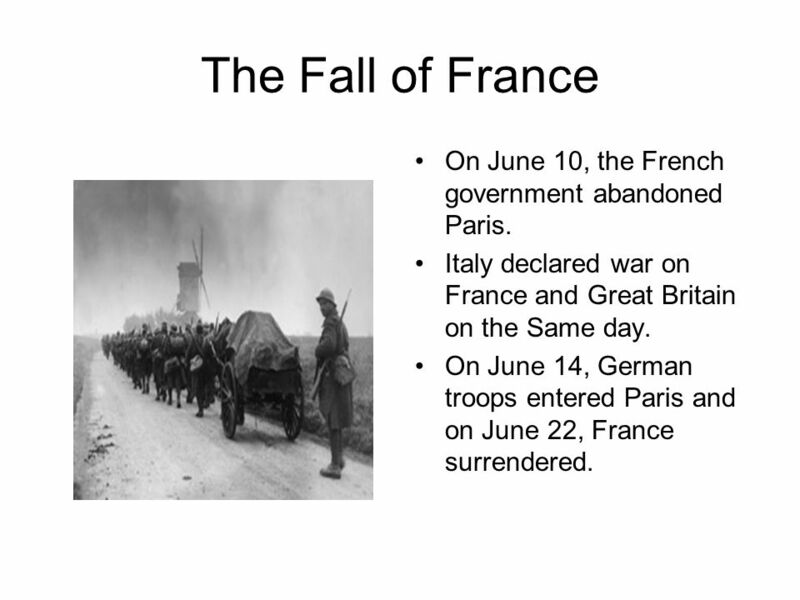 31 The Fall of France On June 10, the French government abandoned Paris. Italy declared war on France and Great Britain on the Same day. On June 14, German troops entered Paris and on June 22, France surrendered. 32 According to the surrender terms, Germany occupied the northern 3/5 of France and the entire Atlantic Coast southward to Spain. Free France, a government in exile in London, continued the struggle against the German invaders from bases in Britain and colonies in Africa. 34 Britain’s large and well equipped navy stood between Hitler and England. German had to control the air to neutralize the standoff. Hitler turned to the Luftwaffe to destroy the British’s air defense. In Late August, a group of German bombers strayed off course and dropped their bombs on London. 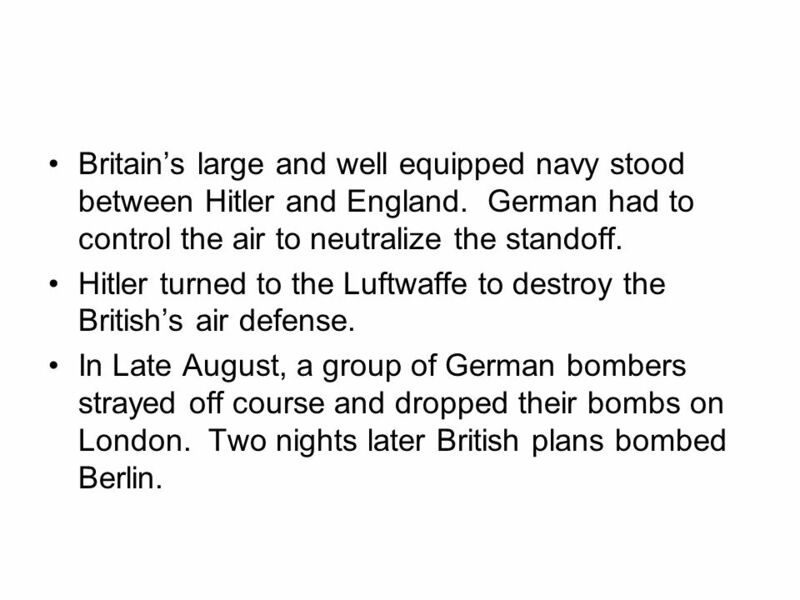 Two nights later British plans bombed Berlin. 35 Courageous Defense Britain’s Royal Air Force stoutly defended its homeland even though they were greatly outnumbered. 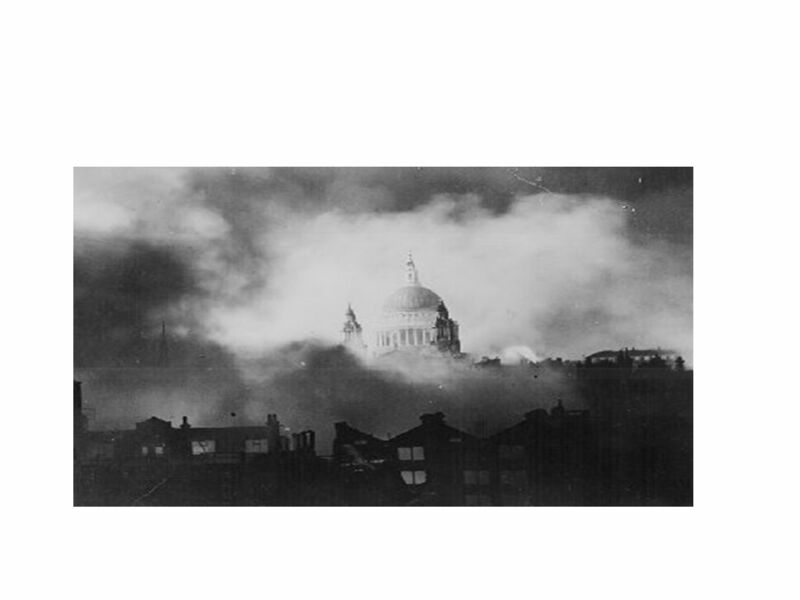 In December 1940, German bombing of London started some 1500 fires, setting the center of the historic city ablaze. By the end of 1941, when the German air raids ended, some 20,000 Londoners had been killed and more than injured. 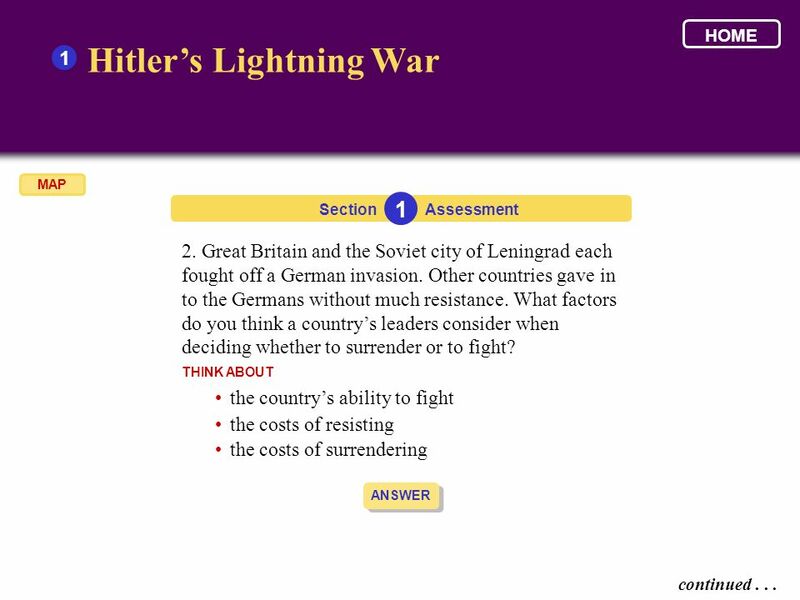 HOME 1 Hitler’s Lightning War MAP Section 1 Assessment 1. Look at the graphic to help organize your thoughts. 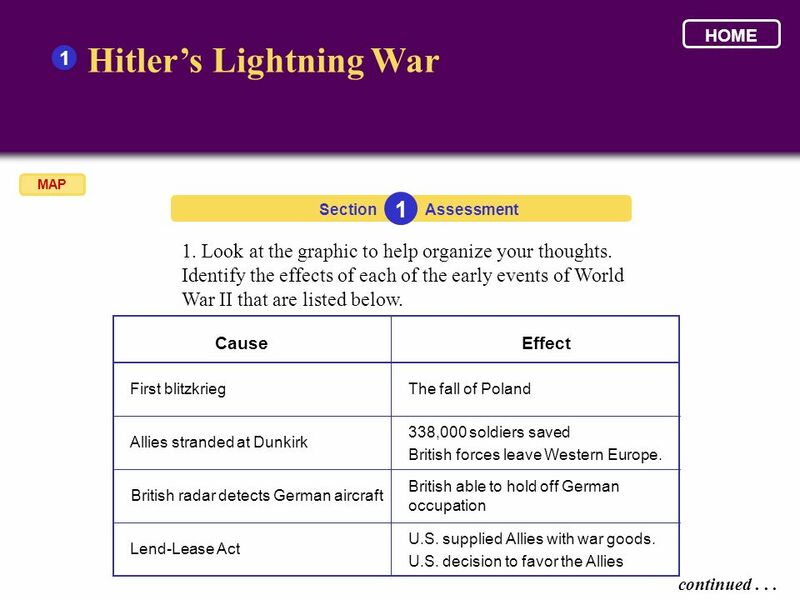 Identify the effects of each of the early events of World War II that are listed below. 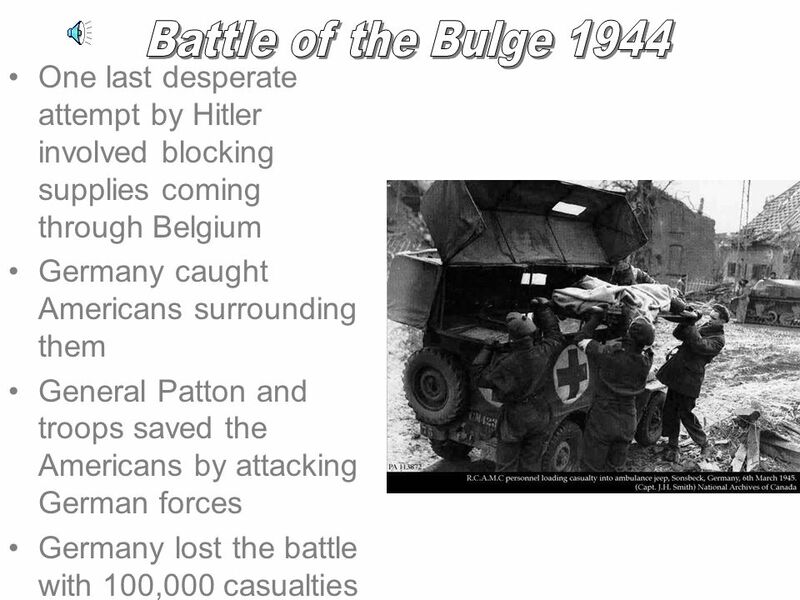 Cause Effect First blitzkrieg Allies stranded at Dunkirk British radar detects German aircraft Lend-Lease Act The fall of Poland 338,000 soldiers saved British forces leave Western Europe. British able to hold off German occupation U.S. supplied Allies with war goods. U.S. decision to favor the Allies continued . 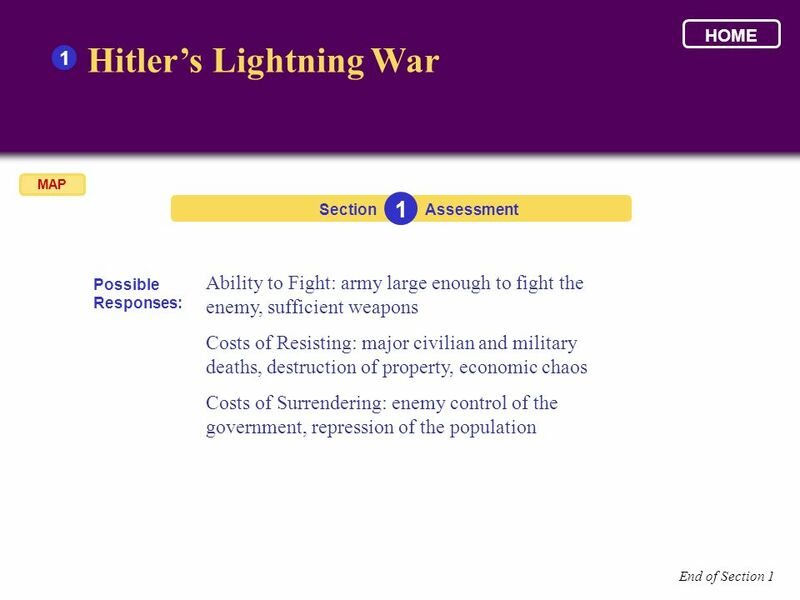 . .
HOME 1 Hitler’s Lightning War MAP Section 1 Assessment 2. 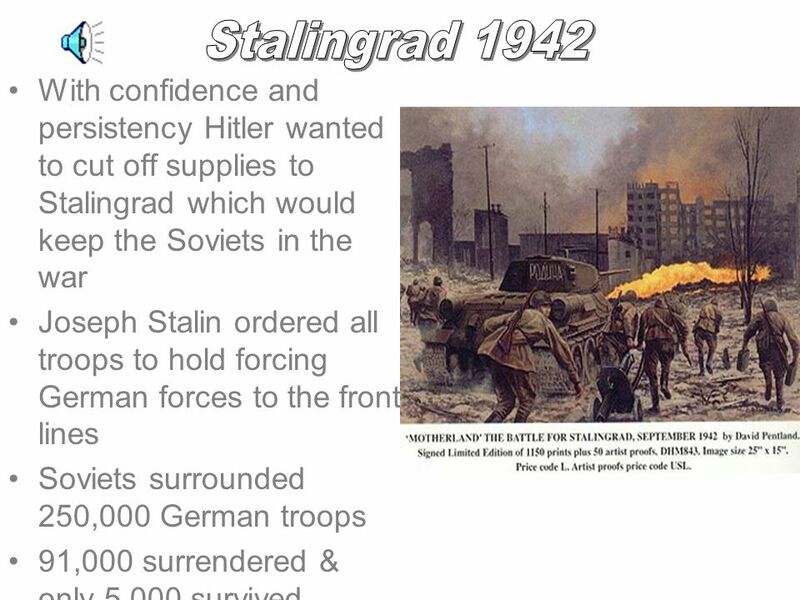 Great Britain and the Soviet city of Leningrad each fought off a German invasion. 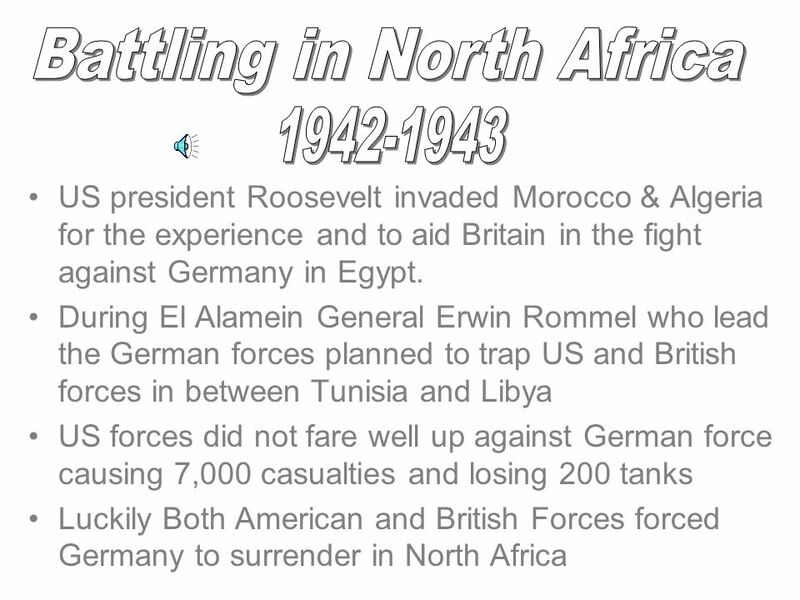 Other countries gave in to the Germans without much resistance. What factors do you think a country’s leaders consider when deciding whether to surrender or to fight? THINK ABOUT • the country’s ability to fight • the costs of resisting • the costs of surrendering ANSWER continued . 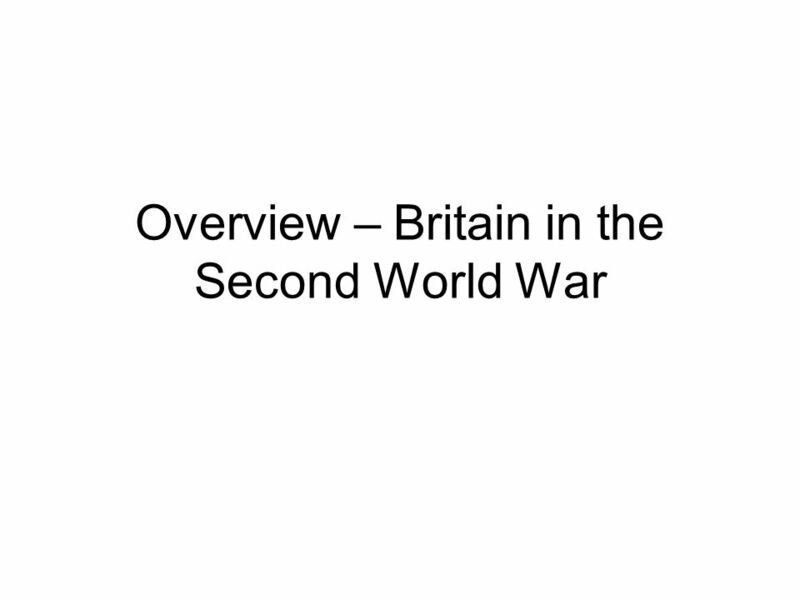 . .
Download ppt "Overview – Britain in the Second World War"
War in Europe Ch 24 Sect 2 Pg 742. Union with Austria Majority of Austrias 6 million people were Germans who favored unification w/ Germany. Germany troops. CHAPTER 20 A WORLD IN FLAMES ( ). 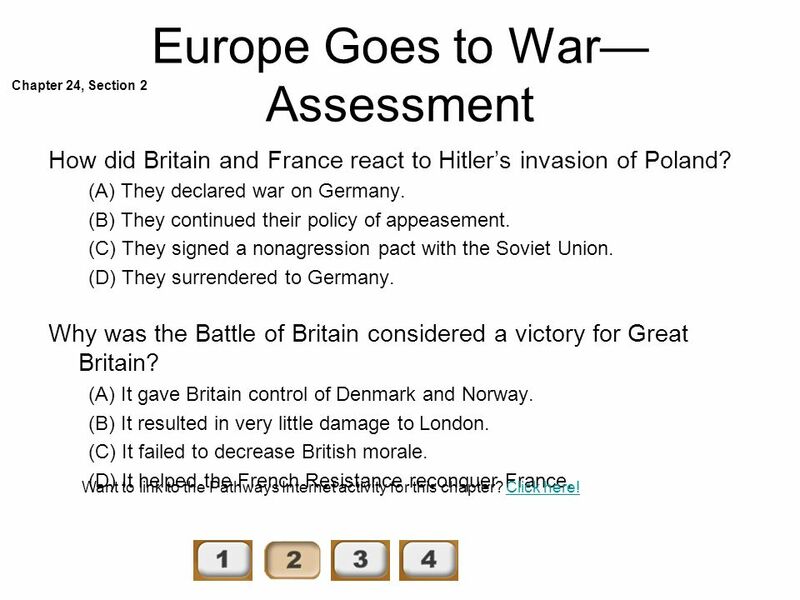 How did Hitler’s expansionist policies lead to WWII in Europe? On a sheet of paper… Judge whether you think countries such as Great Britain and France should have appeased or intervened in the aggressive actions Germany.  Blitzkrieg = “ lightning war” 1. New war fighting tactic developed by Nazis 2. Combined use of armored infantry/tanks/Panzers + air power 3. Focus on. 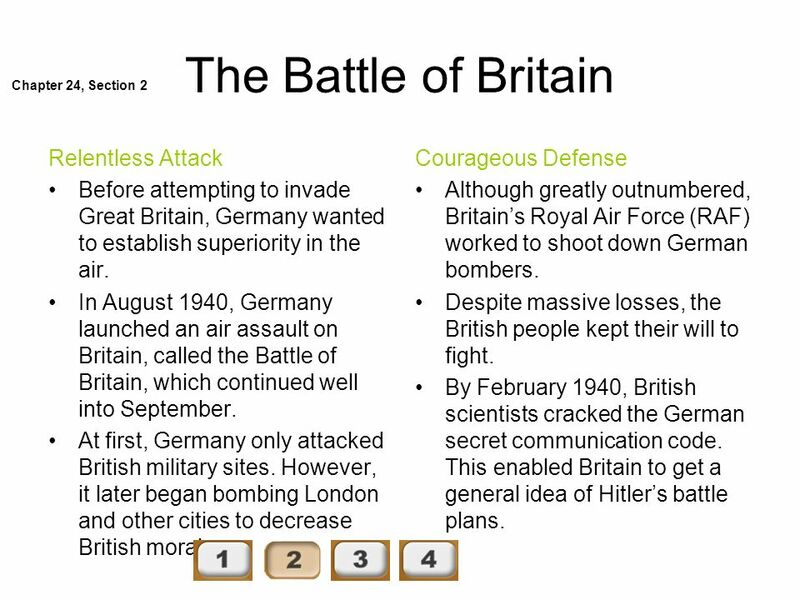 The European Theatre Battles of WWII By: Elizabeth I. 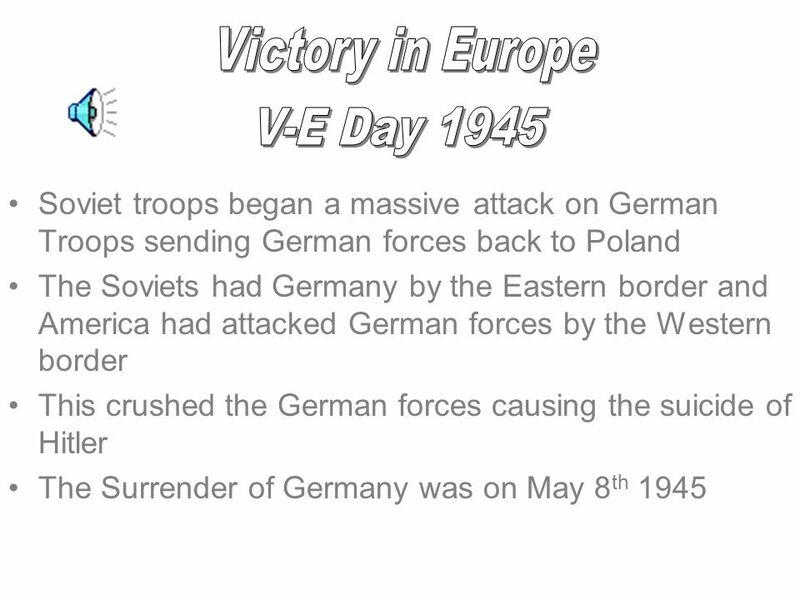 The European Theatre Battles of WWII In your notebook discuss the origin, value, purpose and limitation of the picture Germany. The Beginning of World War II Europe. Hitler’s Rise to Power Hitler’s Background: - hated the Versailles Treaty - humiliated Germany - stripped it’s wealth. Hitler’s Lightning War I. Germany Sparks a New War in Europe A. Germany’s Lightning Attack 1.Months after the signing of the nonaggression pact between. 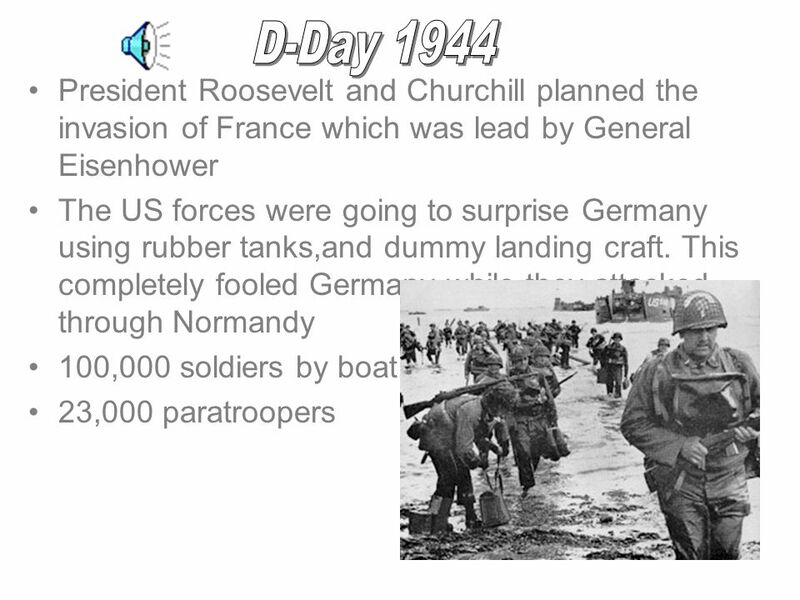 America: Pathways to the Present Chapter 17 World War II: The Road to War “Europe Goes to War” Copyright © 2005 by Pearson Education, Inc., publishing. Europe Goes to War Section 17.2 (pgs ). Which country on the map has the highest unemployment? –Why is this? –What will this mean for the future?